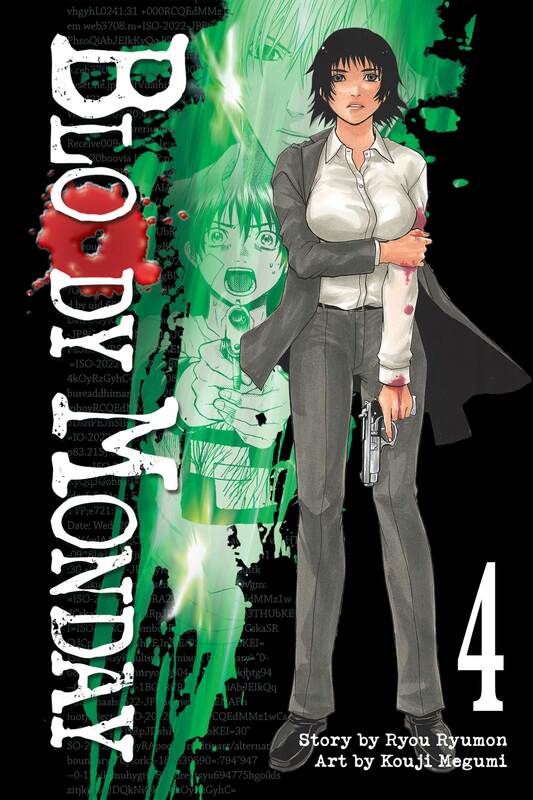 Bloody Monday is a series written by Ryumon Ryou and was illustrated by Megumi Kouji. The fourth volume was published on 14th of February 2012. This volume features the next nine chapters (24-32). You can read my review of the third volume here. After being captured and interrogated by Third-I, Maya Orihara offers to make a deal with Fujimaru Takagi. If she can be granted amnesty for her crimes, then she will give Fujimaru and Third-I some information that will help to solve the case. With the deal approved, Fujimaru, Kano Ikuma and Hosho Sayuri take Maya in a car to transport her to where the information is to be found. However, all is not well as on the car ride over, Fujimaru begins to notice some strange behaviour coming from one of his comrades in Third-I. He begins to suspect that a spy is working to free Maya from her current position. As such Fujimaru must think quickly and put a plan into action to stop her escape. My Review: Makes some big strides in the plot development area. Without spoiling anything we get to see the big reveal of a spy working inside Third-I. I have to say that the book did an excellent job of averting my expectation, completely undermining my thought on who the spy actually was for a character I had thought to be innocent. I really liked the time during the car ride where Fujimaru needs to find a way to contact Third-I and tell them about the spy, it has a pretty good sense of tone. Although I did think it was a little ridiculous how he just happened to know the exact details of Kirishima’s phone. After the spy is revealed, Fujimaru gets a real system shock, having Maya toy with his thoughts and make him unsure of his initial guess. This is where we start to see him realise that he isn’t some super kid (despite the endless comment on how “amazing” he is). Now you would think that this would leave a lasting impression but for the most part, this event is quickly forgotten in next few volumes. All in all, this volume covers some important plot developments and introduces a few new characters into the mix. Having now read the entire series I can say that this book is not as critical as some of the others but still plays a role in some of the events to come. I rate this manga 5.5/10.